Bombino: A Desert Rock 'Nomad' Rolls Into Nashville The Black Keys' Dan Auerbach produced the Tuareg guitar virtuoso's latest album and adds sonic heft rarely heard on African guitar recordings. 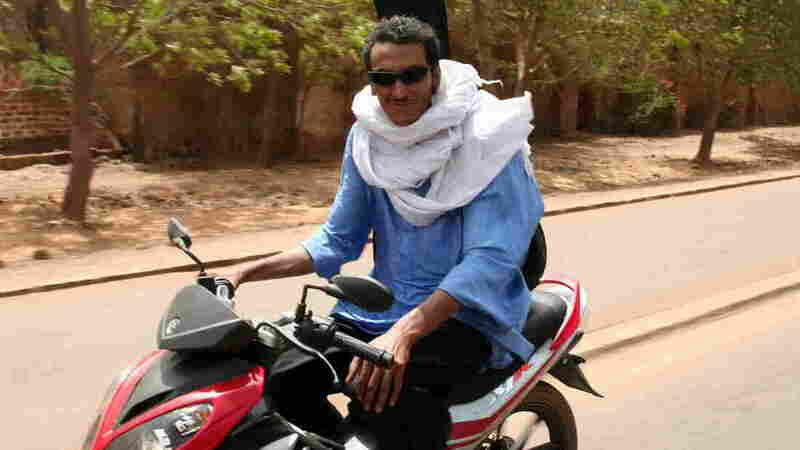 Bombino's new album is titled Nomad. Tuareg bands are natural rockers. These desert nomads have a history of harsh physical challenges, long separations, nostalgia and rebellion — elements that give their music gritty authenticity. There's something about their ambling, tuneful songs that fits perfectly with the bite and snarl of electric guitars. When Dan Auerbach of The Black Keys expressed interest in producing an album for Tuareg singer-guitarist Bombino, the latter knew nothing about the Grammy-winning band and producer. But once they met, and especially when Bombino got into Auerbach's Nashville studio, a bond was formed. Fortunately, Auerbach has done nothing to dilute Bombino's folksy, organic songs. Instead, he's given them sonic heft rarely heard on African guitar recordings — and added a few tasteful Nashville touches, like lap steel guitar. On the new album Nomad, Bombino sings about the need for his people to unite — this at a time when his Sahara Desert homeland is mired in conflict. Bombino is a longtime peace advocate, and in "Imidiwan," he asks his fellow Tuareg to look to their heritage for guidance. The back-porch, country lope of "Imidiwan" marks a departure from the gnarly electric sounds that dominate this session, but it's all part of the Tuareg folk-rock continuum. Nomad is a seductive, friendly album. It doesn't pander with gimmicks or English lyrics, but it manages to bring a distant Islamic culture unexpectedly close through the universal language of rock 'n' roll.